Mix-n-Stain™ Total Protein Prestain Kits are designed for highly linear protein quantitation on SDS-PAGE gels and western blot membranes via protein labeling with near-infrared CF® dyes. 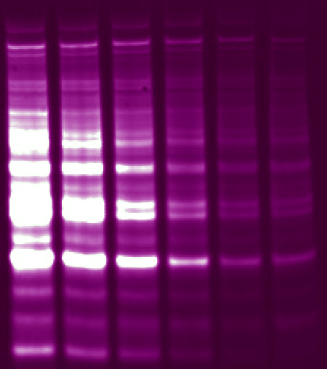 The labeling shows superior linearity for western normalization compared to housekeeping proteins. Mix-n-Stain™ Total Protein Prestain Kits are designed for rapid, sensitive and highly linear quantitation on SDS-PAGE gels and western blot membranes. 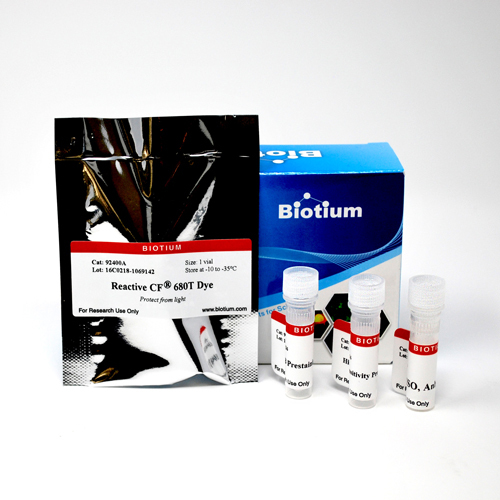 The kits allow easy and fast labeling of purified proteins or cell lysates with near-infrared CF® dyes. To label protein samples with the kits, one simply needs to mix the dye and the buffer with the protein solution, follow by a brief incubation before preparing samples for SDS-PAGE. After electrophoresis, the bands can be visualized using a fluorescent gel scanner, eliminating the need for gel staining. Labeled proteins on SDS-PAGE gels also can be transferred to membranes and detected by western blotting. No purification is needed after labeling, because the excess CF® dye runs to the bottom of the gel and does not interfere with protein imaging. After protein transfer, the excess dye will be washed off the membrane, leaving only the labeled proteins. For western blotting, the kits demonstrate outstanding linearity for quantitation of total protein over a wide dynamic range, outperforming the traditional normalization method based on housekeeping proteins. The prestaining does not affect protein detection by antibodies. For SDS-PAGE gel prestaining, the kits allow detection of low concentration proteins down to 1 ng with minimal background. The dyes do not cause any visible change to the shape or mobility of the bands compared to unlabeled proteins visualized by post-staining methods. Unlike Coomassie™ Brilliant Blue or other post-staining dyes with broad absorption and emission spectra, the bright near-infrared CF® dyes in the kits can be optically separated with a large variety of fluorescently labeled antibodies, allowing multi-color detection. It is important to maintain balanced signal intensity across all channels for multi-color imaging (i.e. not having one color dramatically brighter than others). If signal crosstalk is a concern, we suggest to use the CF®770T total protein staining kit to compliment WB detection using our CF®680 or CF®680R conjugated secondary antibodies. Typhoon is a trademark and Cy dye is a registered trademark of GE Healthcare; Odyssey is a registered trademark of LI-COR Biosciences. Nonfat dry milk is commonly added to blocking buffers minimize background noise in immunodetection procedures such as Western blotting and immunostaining. Milk can be used to block non-specific binding sites on positively charged nylon or PVDF membranes or used for blocking and dilution of antibodies during immunostaining procedures.